The F150 got some step bars. After marveling at the overbuilt brackets, I put them on the truck yesterday. I do give Ford credit for planning on the fact that most trucks end up with steps or running boards of some kind today by placing three studs at each corner of the underside cab for just this purpose. Westin’s beefy brackets bolted right up, and then the bars to them. This is a vastly superior set up to the days of yore when this project involved quasi-universal brackets and drilling holes in things. Did the truck really need them? That depends on how long your legs you are. A 6'2" friend of mine saw no need, but my shorter 5'7" self found the step in height to be just on the high side of comfortable. Due to how tall the frame is, the floor height is actually considerably taller than the exterior would suggest. In sticking with the black on white theme of the truck, black bars were the way to go. This wasn’t a high priority project, but when I found these for $168 shipped (and before the $40 mail-in rebate) from rockauto, it was an easy decision to pick them up. 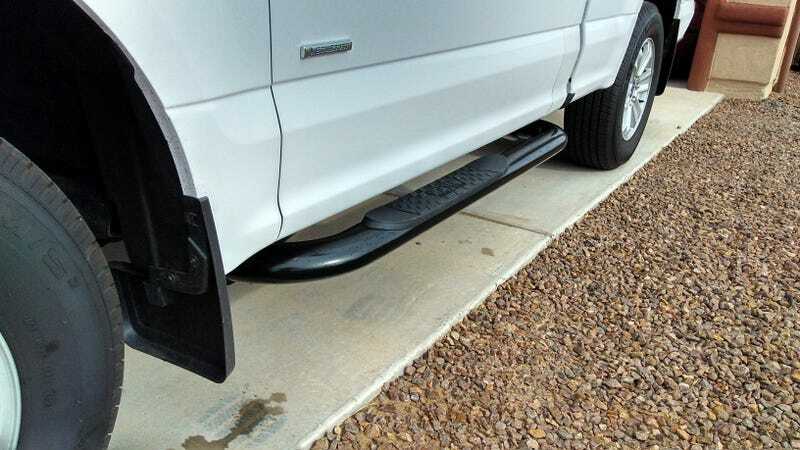 I liked the OEM Ford running boards a bit better, but for $200 less I think these will do fine.